In a large mixing bowl, combine your miniature marshmallows and butter and heat in the microwave for 1 to 2 minutes until the marshmallows grow. Stir and pour your marshmallows over your popcorn and mix well. Spread your popcorn out on your baking pan and sprinkle with M&M’s and sprinkles. In a small microwave safe bowl, heat your candy melts in the microwave for 2 to 3 minutes, stirring every 30 seconds until melted. Pour your melted candy into a sandwich bag and cut a small corner off the bottom. 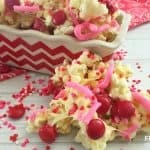 Now drizzle your melted pink chocolate over your popcorn and let your chocolate harden at room temperature.